Just Carol: A Little Pillow Finish! Yep, another little finish! That's two this year - WHOHOO!!! I stitched this last year when I was joining the ladies at Needlecraft Haven, in Barb's parlour. 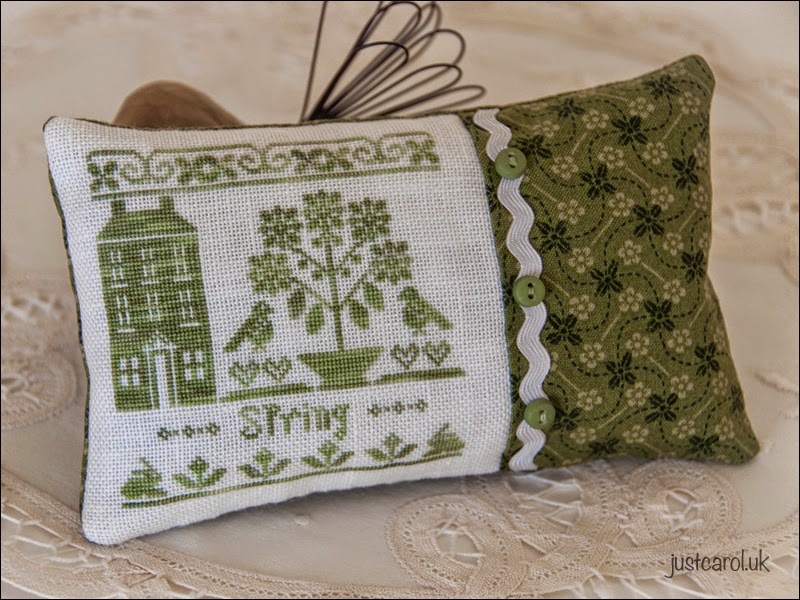 The ladies get together on Wednesdays to stitch on a design of their own choice from either Little House Needleworks, Country Cottage Needleworks or the Sampler Girl. It's been over a year since I've joined in, but must do again soon as I managed to stitch three of the many Little House Needleworks charts I have. This is the first of the three that I have got around to making up. Spring is one of the four Monochromatic seasons. I have substituted the listed fabric and thread, and have stitched it over one on 32ct Antique White Belfast Linen with Forbidden Romance Polstitches Dragon Floss, from the Saying it with Thread range. This is the first time I have used ric rac for finishing, and wasn't sure which would have been the best way to attach it really. but I decided to hand stitch it because I didn't know if I would like the look of seeing a machine stitch running down the centre of it. I thought the little buttons finish it off just right! Such a cute finish. Isn't it great to have people who enjoy the same hobby as you. Beautiful , love the green colours so pretty , hugs. I love the green colour and the over one stitches! Such a dainty little finish, I love green to it appeals to my taste so very much. 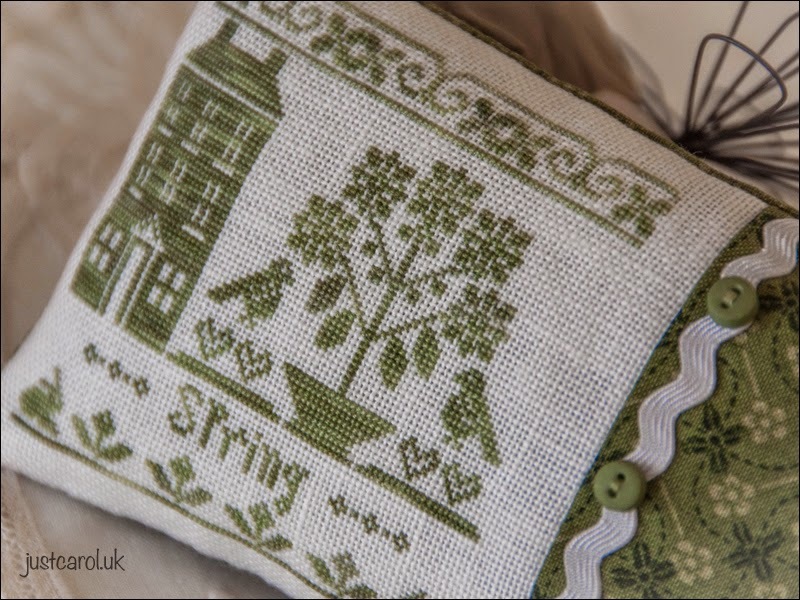 That is so pretty Carol and beautifully finished off.It is always so nice to see your projects. Shirley N.Z. Such a cute finish! And finished off so prettily. Perfect fabric and trim Carol - truly lovely. Very pretty! I love the green! Very beautiful design and a lovely finish!!! Fabric, buttons and stitching accord perfectly.